News & Stories > Blue Sky Science > How are crystals formed? 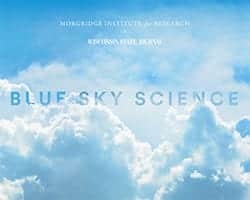 Blue Sky Science: How are crystals formed? The word “crystal” comes from the Greek “krystallos,” meaning clear ice. A crystal is defined as a solid material consisting of a three-dimensional periodic ordering of atoms, molecules or ions. Crystals form by a process called crystallization that signifies a transition from chaos to perfection. Unlike biological systems, crystals do not draw nourishment from within. They grow from the outside by one of three major ways: either from a vapor, from a melt or from a solution. In each case, it’s a three-step process. It begins with nucleation, in which a few molecules or atoms approach each other in a suitable orientation to form a stable submicroscopic aggregate. The second stage is growth, which is an orderly addition of further molecules or atoms to the surface of the crystal in a regular manner. And the final step – termination – stops the growth process. It’s interesting to estimate how rapidly molecules should arrange themselves at the surface of a growing crystal. Even if a crystal is growing at a rate of one-tenth of an inch per day, about 100 layers of molecules must be laid down per second at the crystal surface. In terms of size, there is no limit to how large a crystal one may grow. We are only limited by our patience and material supply. The largest crystal found in nature is a beryl from Madagascar. It measures 59 feet long, 19 feet across and weighs 360 tons. Crystals that are found in nature are called minerals. But there are also crystals that are not found in nature and are made by scientists — for example, crystals of proteins or viruses. Since 2014, the UW-Madison chemistry department has been conducting crystal growing contests among high school students of the state of Wisconsin. In 2016, the contest will be for both middle and high school students. The period for this contest will be from March to May of 2016. How many molecules are in a cubic inch? How do the sun and rain make rainbows?